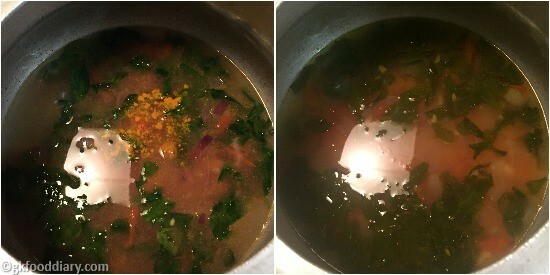 Fenugreek Leaves Soup/Methi Soup/Vendhaya Keerai Soup – healthy, tasty soup with fenugreek leaves, garlic, pepper powder and moong dal for babies, toddlers, and kids. Fenugreek leaves are loaded with fiber, iron, and vitamins. 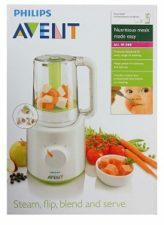 Its good for kids with less appetite and breastfeeding moms. Fenugreek leaves can be included in kids diet in the form of soup, dal, sambar, curry, etc. 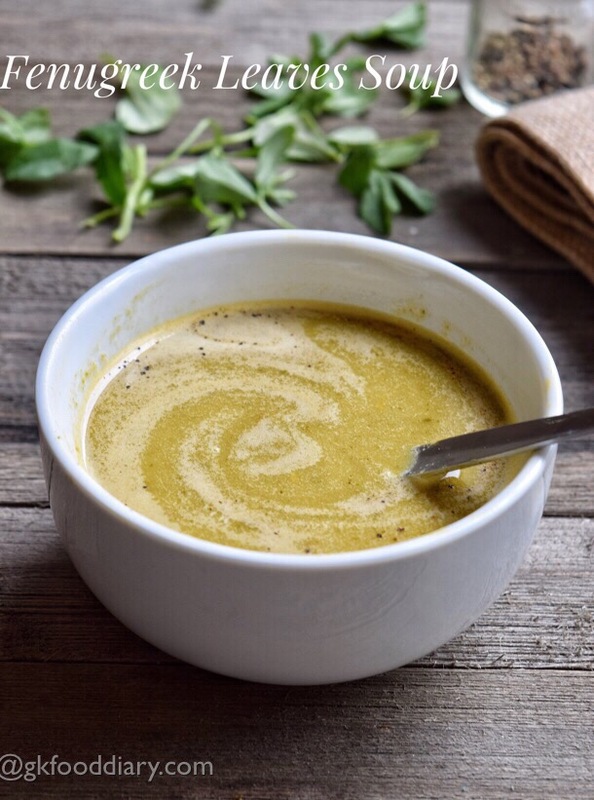 This Fenugreek leaves soup is one of the easiest ways to add this healthy leaves and can be given to babies form 10 months. 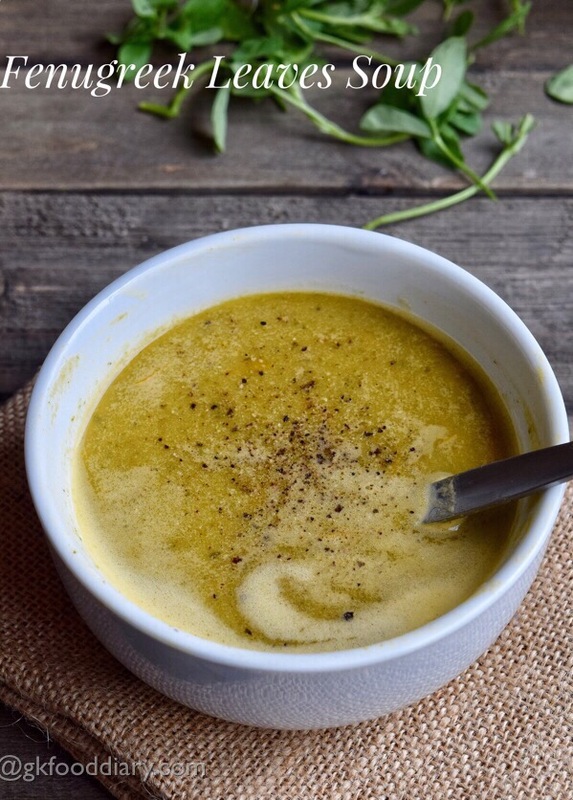 Also, Check out other 20 + healthy soup recipes for babies and kids. Now Let’s check how to make fenugreek leaves soup for babies, toddlers, and kids. 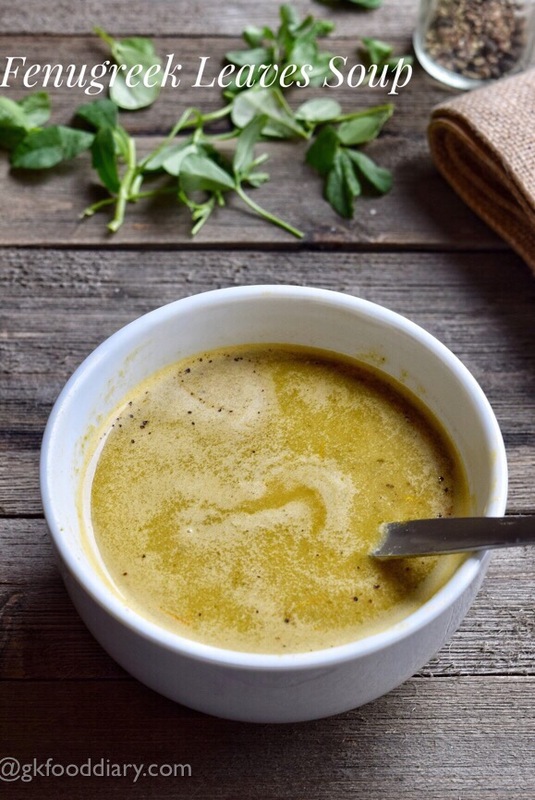 Fenugreek Leaves Soup - Easy and healthy soup for babies and kids with fenugreek leaves & mild spices. Wash fenugreek leaves in running water well. Soak moong dal in water for 10 minutes. 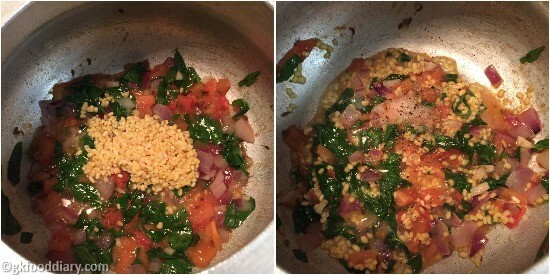 Finely chop onions, tomato & garlic. Keep all the other ingredients ready. In a pressure cooker, heat a tsp of oil and add cumin seeds. Let it splutter. Then add garlic. Saute them for two minutes. Now add onions. Fry them nicely until golden brown. Now add tomato and fry them until mushy. Then add in washed fenugreek leaves. Give a quick stir. Add soaked moong dal and mix well. Add 1.5 cup of water. Sprinkle required salt and turmeric powder. Pressure cook everything together for two whistles in medium low flame. Once the pressure is released, open the cooker. 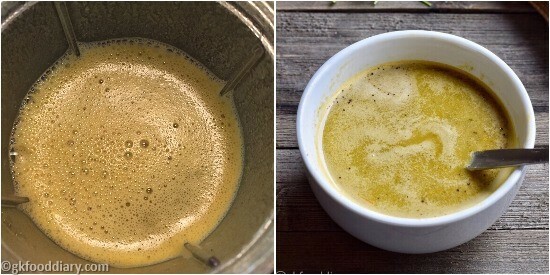 Mash the soup well with a masher or transfer the pressure cooked fenugreek to a blender with water used for cooking). Grind it to a smooth puree. Sprinkle pepper powder and serve the soup warm! 1. Wash fenugreek leaves in running water well. Soak moong dal in water for 10 minutes. 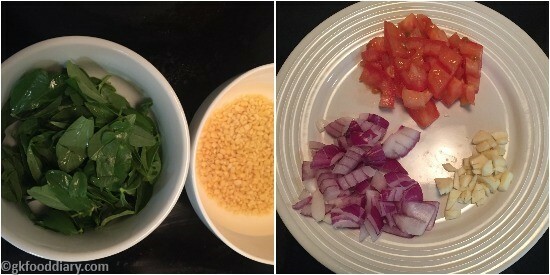 Finely chop onions, tomato & garlic. Keep all the other ingredients ready. 2. 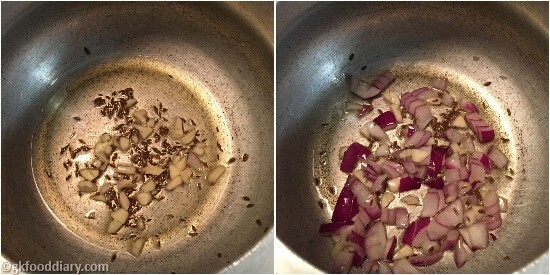 In a pressure cooker, heat a tsp of oil and add cumin seeds. Let it splutter. Then add garlic. Saute them for two minutes. Now add onions. Fry them nicely until golden brown. 3. 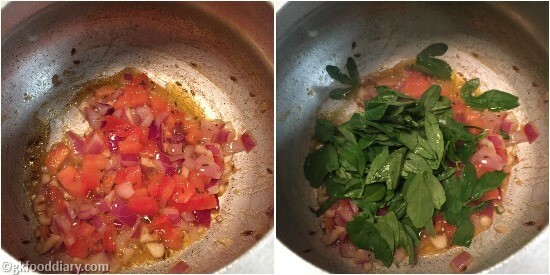 Now add tomato and fry them until mushy. Then add in washed fenugreek leaves. Give a quick stir. 4. Add soaked moong dal and mix well. 5. Add 1.5 cup of water. Sprinkle required slat and turmeric powder. Pressure cook everything together for two whistle in medium low flame. Once the pressure is released open the cooker. 6. Mash the soup well with a masher or alternatively transfer the pressure cooked fenugreek to a blender with a water used for cooking) . Grind it to a smooth puree. Sprinkle pepper powder and serve the soup warm! 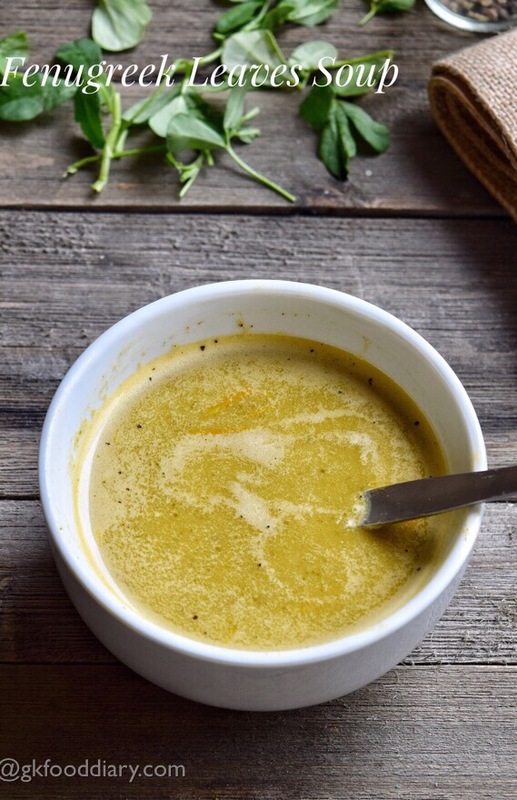 Healthy fenugreek leaves soup is is ready to feed your kid. Make sure to wash the fenugreek leaves well to get rid of mud if any. Adjust pepper powder according to your preference. Dont use more water for pressure cooking. otherwise, the soup will be watery. Skip salt for babies below one year. Nice recipe ,waiting for more recipes.